This month’s round of children’s books is abundant with ghosts, islands, animals and brave socially-aware youngsters. Simple words and pictures containing more than one story make this a dramatic picture book that will spark discussions with empathetic young readers. Maree Coote continues her run of unique Australian picture books with this alphabet-strewn vision of the Big Apple. Each page features colourful renditions of New York landmarks, buildings, museums and personalities (real and mythical), each one niftily constructed by letters. There are squirrels to find, letters to spot and rhyming verse to explain it all. A cargo ship carrying a shipment of robots goes aground, and the animals of an island have to contend with these new curiosities. Roz is a robot who is activated by a bunch of curious otters, and she has much to learn about her new environment. Even though Roz can’t feel emotions, she is programmed to be curious, helpful and flexible, all of which help her in getting along with the suspicious animals. 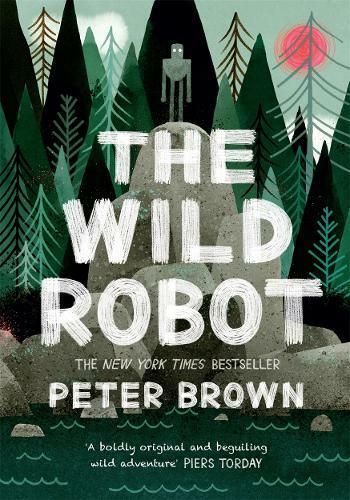 Beautifully illustrated by Brown, already well-known for this picture books, this is a sweet novel about technology and nature. Hawthorn children’s buyer Alexa, highly recommends it as ‘imaginative, quirky and touching’. You can read her review here. Legendary Bridge to Terabithia author Paterson has written a fascinating story set in 1960s Cuba, following a young girl who volunteers for Castro’s ambitious program to make Cuba literate within one year. Lora, a 13-year-old Havana student, offers herself to the program against her family’s wishes, and embarks on an eye-opening year with her host family in the country. Not only do Lora’s host community learn to read and write under her tutelage, but Lora herself learns much about the rural way of life. Readings Kids buyer Angela was impressed: ‘Filled with wonderful characters and incredible warmth, this is a fascinating story of a society very different from our own.’ You can read her review here. When the Australian Outhwaite family moves to London, their grand new home brings expected real life challenges, along with surprising ghostly ones. The five children, from teenager Else to little Sibbi, sense the odd atmosphere immediately in the rambling, rundown, four-storey house, and ghosts Almost Annie and Hardly Alice are just as spooked by the new residents. This is a delightful family drama, chock-full of the utterly believable emotions and problems of the displaced Outhwaites, and the equally believable supernatural forces that weave throughout. Doncaster children’s buyer Natalie describes Russon’s book as ‘enthralling and just a little bit scary’. You can read her review here. Young Letta lives in the Ark, a walled community run by oppressive leader, John Noa. In this post-climate-apocalypse community, language and words are strictly circumscribed, and using forbidden words can get you banished. Language-loving Letta is lucky enough to be apprentice to the Wordsmith, the keeper and archivist of all words. When Letta chooses to help a wounded outlaw boy, she discovers unsettling truths about her community, and must choose if she should defend her principles and oppose a dangerous leader. Readings Kids buyer Angela says: ‘This is a compelling and sophisticated page-turner with a gutsy heroine that has much to say about censorship and the importance of language in making us human.’ You can read her review here. It’s the beginning of a new reading year, and we’ve got lots of ideas and suggestions for keeping young bookworms inspired and entertained. If a new school, new class, new teacher or other new situation is proving challenging for your kid, you might like to browse our picks for the best picture books about making and keeping friends. We also wrote about empowering books for raising young activists. These are 10 books that we hope will inspire readers (aged from preschool to teenagers) to feel they can make a positive change to the world around them. The popularity of R.J. Palacio’s Wonder seems never to cease. If you fell in love with Auggie, here is a handy guide of what you might like to read next. And finally, we put together a list of classic children’s book paired with modern counterparts.